Dmitri was a Russian pastor leading a house church. As townspeople heard of the powerful manifestations of God taking place among the worshipers, more and more crowded into Dimitri’s home to hear about Jesus. One night, more than 150 people gathered. The authorities couldn’t let this continue, so they sent Dmitri a thousand kilometers away from his family and locked him in prison. He was the only believer among 1,500 hardened criminals. His captors tortured him to force him to renounce his faith, but Dmitri held firm. 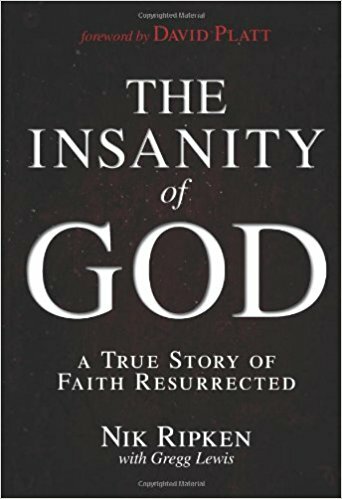 Nik Ripken’s book, The Insanity of God, A True Story of Faith Resurrected, describes what happened next. The other prisoners would laugh, curse, and jeer. “They’d bang metal cups against the iron bars in angry protest. They threw food and sometimes human waste to try to shut him up and extinguish the only true light shining in that dark place every morning at dawn” (p. 156). One day, Dmitri found a full sheet of paper and a pencil in the prison yard. “I rushed back to my jail cell, and I wrote every Scripture reference, every Bible verse, every story, and every song I could recall.” He posted it on a damp pipe in his cell as an offering to the Lord. His jailor saw it, beat and punished him, and threatened him with execution. Shocked, his jailors released their hold and backed away from him. “Who are you?” one demanded. Dimitri straightened his back and stood as tall and as proud as he could. “I am a son of the Living God, and Jesus is His name!” The guards returned him to his cell and shortly afterward, he was released and returned to his family. Every morning, for 17 years, Dmitri sang his HeartSong™. In the face of intense opposition and persecution, he offered praise to God. In the darkest and most hopeless of circumstances, he clung to the Lord Jesus and proclaimed his faith. By all outward appearances, Dmitri’s prison “ministry” was fruitless. He was one man, surrounded by evil, clinging to a God who seemed to have forgotten him. But because Dmitri lived to tell his story, we know better. Through his testimony, God cracks the curtain on the mystery of stubborn faith in the face of suffering. Most of us will never suffer for our faith as Dmitri has, but we are suffering. Health crises, job loss, wayward children, broken marriages, financial ruin, infertility, loneliness, and depression lock us in prison and torture us until we think we might break. 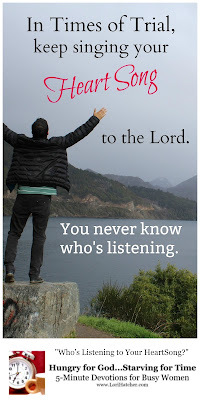 Yet every day, sometimes with voices that others must strain to hear, we lift our HeartSongs™ to God. We may not sing aloud, although sometimes we do. Most days those around us hear our songs through our actions and our words. We continue to pray. We refuse to lose hope. We serve God despite our heartache, and proclaim his goodness to anyone who will listen. We place our hand in the nail-scarred hand of Jesus and declare with Job, “Though he slay me, yet will I trust in him” (Job 13:15). Our lives of faith and service are our offerings of praise for all the world to hear. Dear suffering friend, like the prisoners in Dmitri's story, someone near you is listening to your HeartSong™. Now it’s your turn. Has God ever revealed to you, perhaps years later, that someone was watching how you walked through a trial? Leave a comment below and share your story. Would you like to hear Dmitri's HeartSong? Here's a haunting clip from the movie. If you’re reading by email, CLICK HERE to watch the clip. If you’d like to read or watch more stories of those who follow Jesus when it doesn’t make sense, click HERE for The Insanity of God book and HERE for the Insanity of God DVD.